Move over Siri, Evi is the new kid in town. It’s no Watson, but Evi, created by True Knowledge, a Cambridge, U.K.-based semantic technology startup, like Siri, can answer questions posed by voice (using Nuance software) in a conversational manner or by typing. 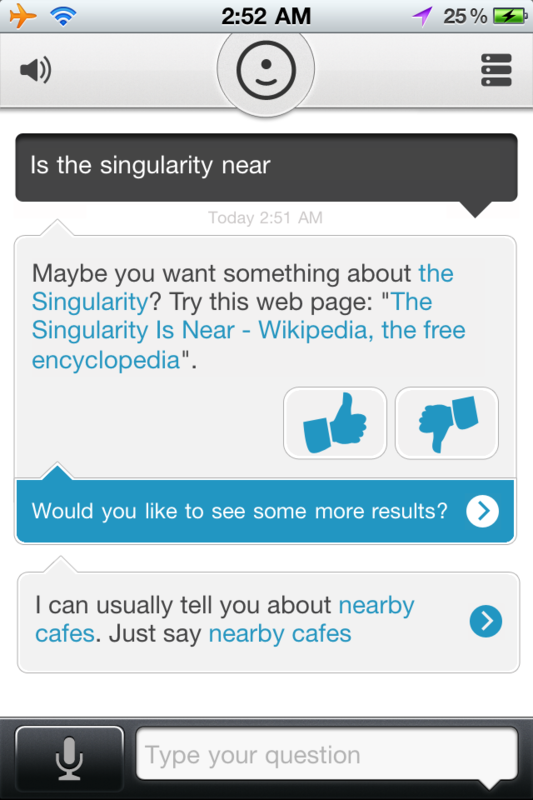 But unlike Siri (only available on iPhone 4S), Evi runs on the iPhone, iPod touch, and iPad (with iOS 4.0 or later), and on phones running Google’s Android software. The True Knowledge page claims 635,025,637 facts on 27,805,648 things that True Knowledge has developed over several years (initially for Web search). “Information in this database has been tagged to add meaning and context,” it says. Evi can’t help you set up an appointment, but it does a great job with general facts, and includes international information, unlike Siri. It also handles Yelp-like queries (it accurately located the 11 restaurants nearest me). Many users have found Evi has been plagued with server access problems, but it worked OK for me in late-night tests. More later after I test Evi on more complex questions and see where it breaks.